Since filing its first lawsuit to block companies from selling fraudulent positive reviews last April, Amazon has taken a number of steps to cutback on the number of fake review peppering its site: data mining reviewers’ personal relationships, tweaking how reviews appear on product pages, and suing more than 1,100 individual reviewers who sell their kind words. Now the e-commerce giant has sued five additional sites, accusing them of selling sham reviews. Amazon filed the lawsuit Friday in a Washington state court against five websites — PaidBookReviews.org, AmazonVerifiedReviews.com, AmazonReviewsStar.com, BuyAmazonReviews.info, and ReviewConnections.com — and their operators, accusing the companies of an array of illegal business practices that undermine the e-tailer’s operations. The lawsuit accuses the defendants of trademark infringement, false advertising, and violations of the Anticyber­squatting Consumer Protection Act and the Washington Consumer Protection Act – used by the defendant businesses in order to facilitate the creation of positive paid reviews. Amazon claims that the businesses offer to create Amazon reviews guaranteeing a certain star rating and, in some cases, provide text to be used by reviewers. AmazonVerifiedReviews.com was not operational on Monday, however, a cache of the site from 2015 shows it sold “verified” book reviews and “verified” product reviews. “We live in a world completely dependent on the online medium. It is what happens on the web that often tips the balance in your favor and gets you & your work noticed or can create a long-term damage from which you will hardly ever recover,” the site opined to prospective customers. 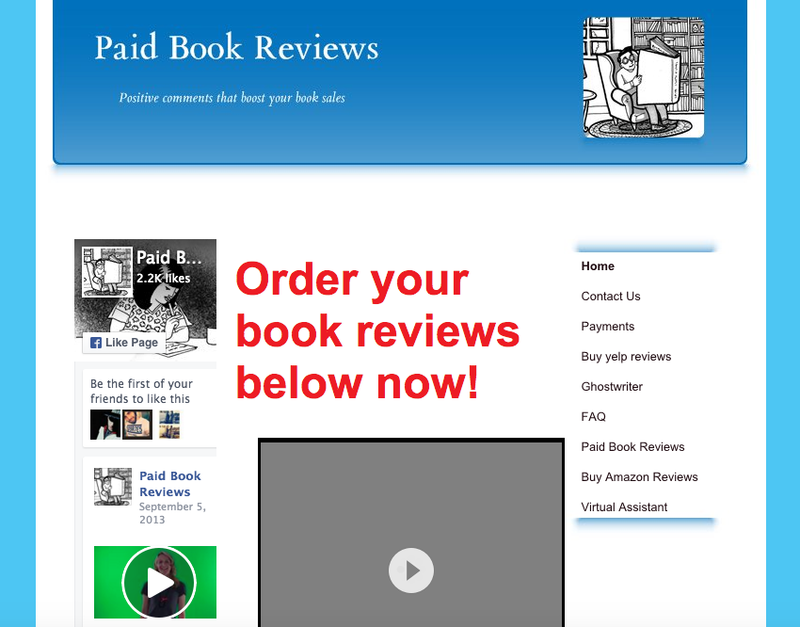 PaidBookReview.org offers just that, positive book reviews in exchange for cash. According to Amazon’s lawsuit, the site’s Frequently Asked Questions page specifically promises no review will be below 4 or 5 stars, that a team of individuals assists in writing the reviews and that reviewers won’t mention they were paid for their services. The website was still operational on Tuesday, offering customers the option to buy anywhere from five reviews for $125 to 100 reviews for $2,200. AmazonReviewsStar.com and ReviewConnections.com were still running on Tuesday, while a cache of BuyAmazonReviews.com shows the site’s domain expired in March. The lawsuit — the third Amazon has filed since April 2015 — is the company’s latest attempt to protect consumer reviews from being negated by falsified testimonials. So far, the company, which declined to comment on specific aspects of ongoing cases, tells the Seattle Times it has sued more than 1,000 people for tampering with its review system, the Seattle Times reports. With the latest lawsuit Amazon seeks to stop the sites from using Amazon’s trademark, stop offering Amazon reviews for sale, and help Amazon find those engaged in fake reviews.